I'm currently trying to make a showcase of different skills for my entry to University next year, I'm currently in the throws of making a lighting showcase level and want to have it so that when I press 1,2,3 and 4 it will change the lighting in the map. 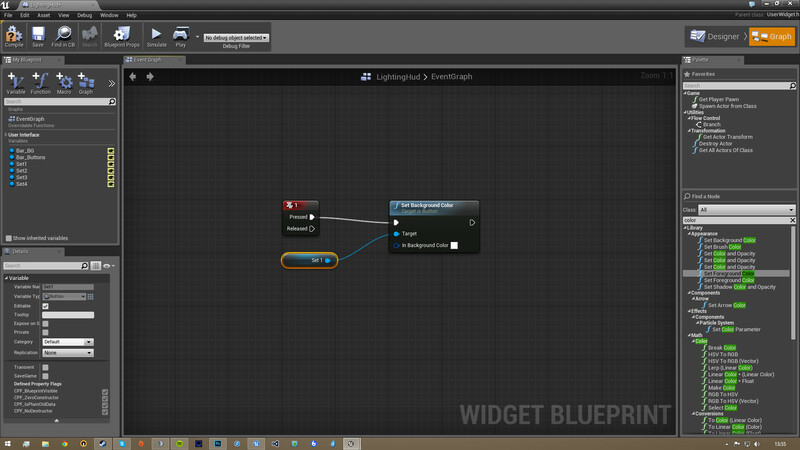 I have the functionality for the actual light changing done, but I am struggling with the UMG part for the HUD. When I press the 1 key for instance, I want the color of the button on the hud to change. Here is what I have in place but it isn't working for some reason, yet everything is compiling ok. I have a feeling it may be an input issue as when I simulate the widget and press 1, nothing seems to happen. I have been experiencing the identical issue in UMG. Created a question here but haven't gotten a response yet. Seems like the UMG blueprint doesn't hear KeyPress events. I'll be following your question here for any information you get! Yeah, can't remember what thread I saw it in, but I think I remember a Dev saying that input issues have been resolved in the 4.5.x build they are working on. Think it's just something we'll have to wait for. How can I use BP to set different BP instances as enabled or disabled within my scene?